In my experience, most non-profit organizations could use a rebrand, a brand refresh, or at the very least, a brand clarification. However, the reality is that it’s difficult for non-profits to divert limited time and resources toward branding. But here’s the thing, it’s the ONE ENDEAVOR that can make all your other efforts much more impactful. From the outside, a cohesive brand is how a potential or existing supporter relates to you, comes to trust your organization, and feels compelled to support your mission. It allows your audience to clearly understand your impact on the community. From the inside, a cohesive brand is all about making sure your message and visuals are clear, concise, and compelling across all platforms. Whether someone attends a fundraising event, volunteers with your organization, visits your website, or follows you on social media, having a cohesive brand means they will have a consistent, trustworthy experience. 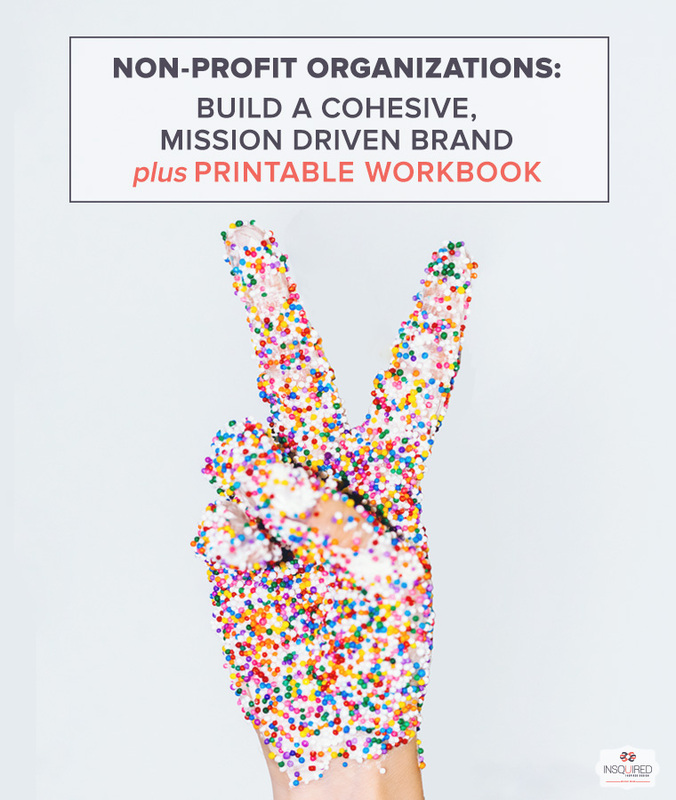 If you’re in the process of setting up a non-profit organization, this workbook will walk you through building a cohesive brand from the ground up. If you’re further along, whether it’s months or years, carefully considering your brand and then implementing the strategies outlined in this exercise will bring clarity and cohesiveness to your organization and brand-building efforts. Have questions? Email me at faeda@insquired.com. I’ll help you dive deeper into building your brand. PS. For your convenience, I have also attached these questions as a printable workbook below. STEP 1: DEFINE YOUR ORGANIZATION. What value do we bring to the community? What are we best at doing? Which programs or services should we stop offering, continue to offer, or start offering, based on our ideal audience and our mission? What are we doing to innovate or move our organization forward? Where do we want our organization to be in one year? Five years? STEP 2. DEFINE YOUR NETWORK. List the demographics of EACH TYPE OF AUDIENCE (donors, volunteers, supporters, recipients) as applied to our organization. Education level? Married/single? Kids or no kids? What would drive them to make a donation to, volunteer for, or support our organization? Where do they get their information? What television programs do they watch? What magazines, newspapers, email newsletters, blogs, etc. do they read? What are their key issues and concerns? What do they think when they think of us, our product/service and organization? What do they feel when they consider our mission? STEP 3: CREATE A BRAND STRATEGY. In what ways are we similar to other organizations? What brands do we admire? What about these brands do we admire? What is their tone and voice like? What is our organization’s voice: Serious or light-hearted? Authoritative or casual? Expert or learn-as-we-go? Will we speak to our audience in first person (“I” or “we”), second person (“you”), or third person (“he, she, they”)? What is our brand style: Loud or subdued? Traditional or modern? Classic or cutting edge? How do we show that we’re different in words, actions, and images? How do we want to be perceived by the public and in our network? How often are we communicating with our audience? How often would we like to communicate with them? On what platforms? How do you want people to feel when they experience your organization? What is your brand promise to your staff, donors, and volunteers? STEP 4: CREATE A COHESIVE BRAND FOUNDATION. Compile the answers into the following buckets. Stay focused on being consistent between buckets. Who we are, what impact we will have, and what we stand for. How we will sound throughout our organization. Where will we appear, how often, and what we will communicate. Completed the workbook? You now have a solid brand foundation. Begin integrating it into all your communication and marketing efforts: Website, Blog, Print and Email Newsletter, Appeal Letters, Brochures, Social Media, Collateral. If you get stuck, need help or just another pair of eyes to look things over, email me at faeda@insquired.com.